Regency Highland is a luxury waterfront community comprised of multiple buildings and types of residences in Highland Beach. Within Regency Highland is a 14 story building with 190 condos, a 6 story building with 24 condos, and 6 townhomes nestled between the Atlantic Ocean and Intracoastal Waterway. Interested residents are stunned by the various upgrades featured in many of the units such as large entrances, spacious kitchens, granite countertops, and large master bedrooms with walk-in closets. From each private balcony, views of the ocean, tropical landscaping on the property, and surrounding city views can be seen. Regency Highland condo community is gated in order to ensure residents’ safety at all times, but the 5-star amenities don’t stop there! 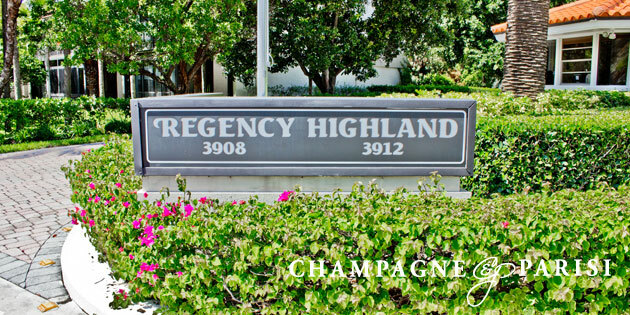 Regency Highland in Highland Beach also offers its residents amazing swimming pools, tennis courts, fitness center, covered garage, game rooms, space for social gatherings, as well as a storage room. Residents will be most pleased with their easy access to a private beach including lounge chairs and a tiki hut. Beyond the community residents are just a very short drive away from a bustling city, comprised of exquisite shops, fine dining, and fabulous entertainment. You’ll never be far from your destination with many major highways and two international airports close by.